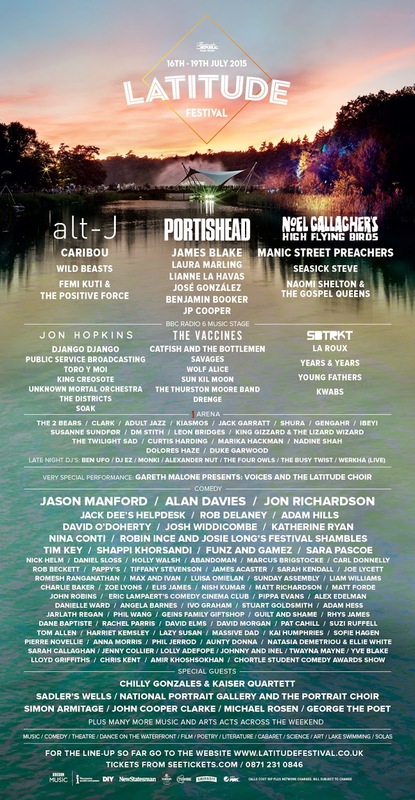 "I'm delighted to reveal the first acts for Latitude 2015, with alt-j, Portishead, Noel Gallagher, Alan Davies, Jon Richardson and Jason Manford heading up a music and arts bill that is as strong as it is broad. This year is the 10th Edition of the festival and we're celebrating with an event which, although it has evolved significantly from the intimate 4,000 attendees we started out with, I really feel has kept the special atmosphere and unique quality which sets it apart". You can check out the full line-up along with the poster below.